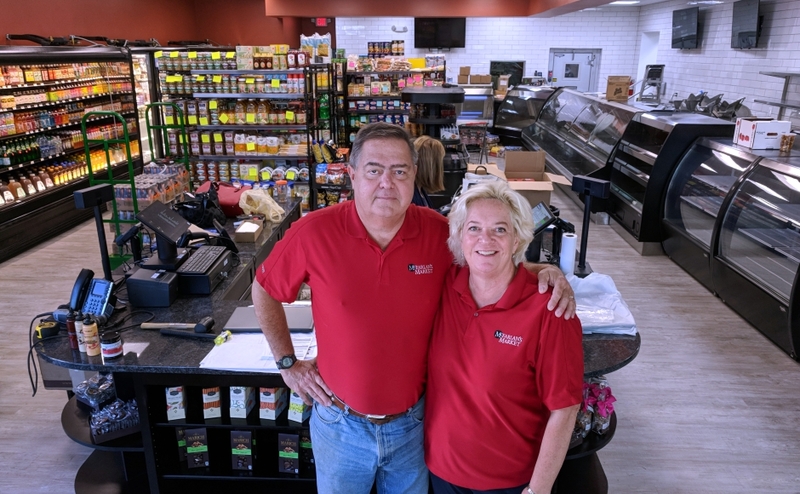 McFarlan's Market owners Pete Burgess and Janet Stevens inside their Collingswood shop. Credit: Matt Skoufalos. After six years of planning and labor, the Merchantville-headquartered corner grocery store will open its Collingswood location on the last day of summer 2018. McFarlan’s Market owners Pete Burgess and Janet Stevens outside of their Collingswood storefront. Credit: Matt Skoufalos. 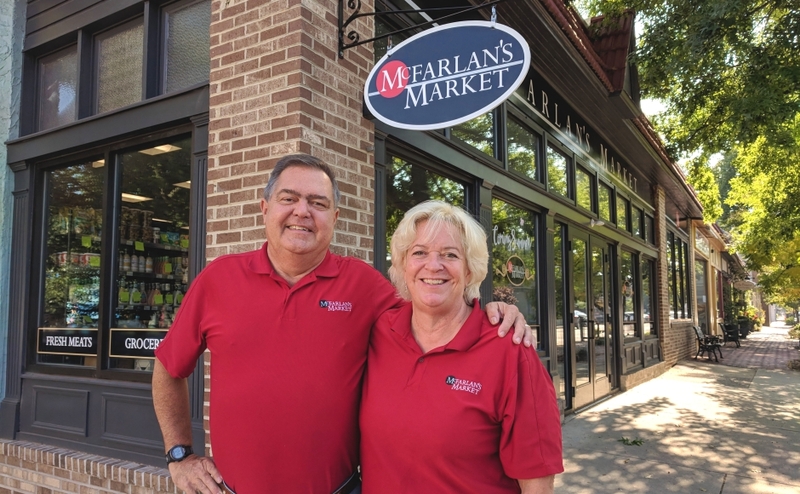 When Pete Burgess and Janet Stevens opened McFarlan’s Market in 2010, one of their earliest customers was Collingswood mayor Jim Maley. “[He] came in and said, ‘How come you didn’t open in Collingswood?’” Burgess recalled. For almost six of the eight years the corner grocery has operated in Merchantville, the couple has been working to meet that request. Now there’s an opening date in sight. 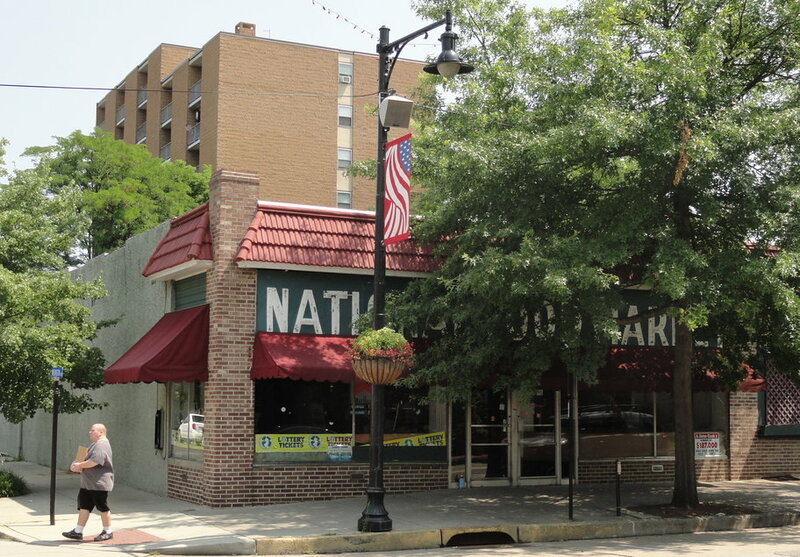 In 2012, the Collingswood borough government began moving to acquire the National Market property at 741 Haddon Avenue, citing its spotty hours and health code violations. By 2014, a deal had been brokered with owner Shinder Pal with the intention of flipping the shop to Burgess and Stevens. The couple’s plans for the space cleared the zoning board later that year, and work was set to begin for a 2015 opening. Those six-month plans were interrupted by intermittent delays, from the discovery of an old underground oil tank on the property, to a wait for new utility connections. The former National Food Market, prior to its conversion into a second McFarlan’s Market grocery. Credit: Matt Skoufalos. “We did all our demo with a portable generator powering the tools we needed, and then we waited for our electrical service, which took some months,” Burgess said. “We would work, and weeks would go by while we waited for a decision, a delivery, a window of opportunity,” he said. “I respect everyone’s patience, and appreciate their impatience,” Burgess said. On September 22, the store will welcome shoppers for the first time, fulfilling its promise to open in summer 2018 (albeit on the final day of the season). “It was a photo finish, but we got there,” Burgess said. 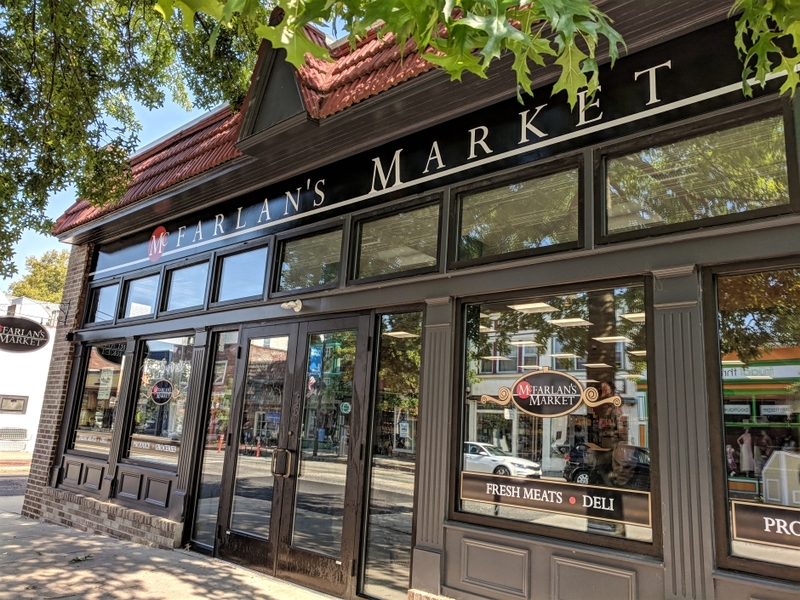 McFarlan’s will be the first downtown grocery store in Collingswood since the ill-omened Local Market shuttered after just three weeks in 2014. With a 2,200-item inventory of national and specialty brands, an in-house butcher, and a made-to-order deli counter, the shop is intended to replace shoppers’ weekly trips to big-box supermarkets with smaller, more frequent, local runs. Janet Stevens stocks the shelves at McFarlan’s Market in Collingswood. Credit: Matt Skoufalos. “My goal is to be the old-school, corner grocer with personalized service,” Burgess said. McFarlan’s Market also features a 26-seat, dine-in café for customers to enjoy freshly prepared meals from its commercial kitchen. Chefs Athan Crialis and Omega Ellis have won over Merchantville shoppers with their beef and chicken pot pies, macaroni and cheese, and stuffed pepper dishes, and vegan and vegetarian options will round out the menu, Stevens said. The refrigerator also offers a window view for the public to watch Butcher Ross Pile prepare fresh cuts of meat. “Most everything that we do is made to order while you wait,” Stevens said. 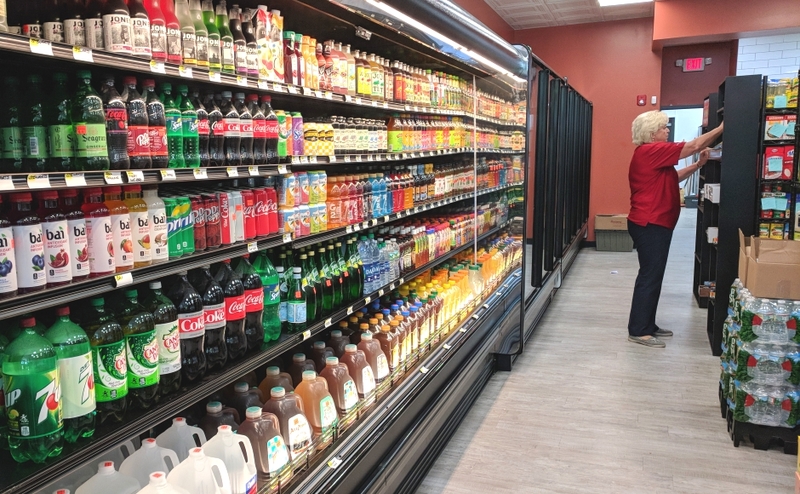 The 2,000-square-foot store offers a broad inventory of products, from organic produce and cane sugar sodas to local flavors like Di Bruno Bros., Bassett’s ice cream, and Revolution Coffee. Interior, McFarlan’s Market, Collingswood. Credit: Matt Skoufalos. “We work through a broker who supplies specialty items, so we have some things that you won’t find anywhere else,” Stevens said. The storefront shows well the efforts of the long hours spent in its restoration. About all that remains of the prior construction, which was gutted to the studs, is a 10 by 10 area of plaster and three frosted-pane windows that the demolition uncovered. Transom windows above the entrance were rebuilt to original specifications with insulated glass, and the façade was renovated and reinforced with steel columns. There’s new sewer, electric, and gas lines; new mechanical equipment, and new cabinets, countertops, and a shiplap wall produced by Haddon Avenue neighbor Collingswood Cabinets. Now all that’s left to do is open the doors. Exterior, McFarlan’s Market, Collingswood. Credit: Matt Skoufalos. “We’ve had a great experience with the town,” Stevens said. “People have been so patient and kind in talking to us. 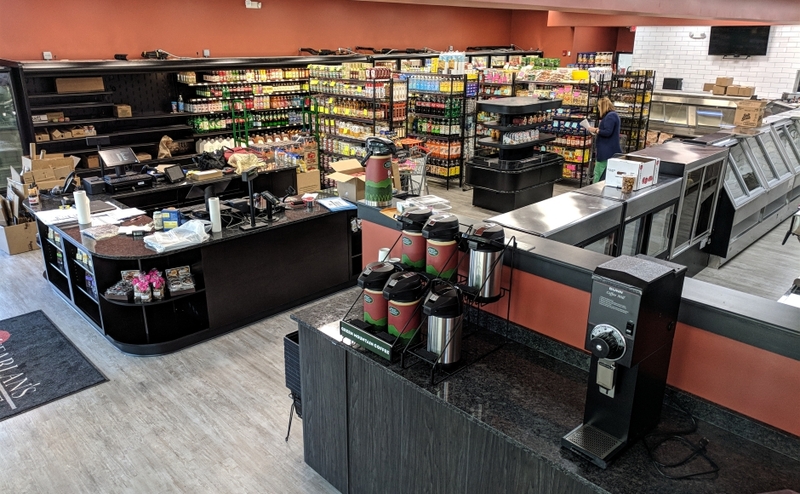 McFarlan’s Market will celebrate its grand opening at 10 a.m. September 22 with live music, fresh coffee, shopping bag and gift card giveaways, and entertainment for children. The first 50 customers will get 20 percent off their grocery order. Hours of operation will be 8 a.m. to 7 p.m. Monday through Wednesday, 8 a.m. to 9 p.m. Thursday through Saturday, and 8 a.m. to 5 p.m. Sunday.